Add stylish industriousness to outdoor commercial lighting with the 12" Warehouse Shade Gooseneck Light. Paired here with a long arching gooseneck arm, this is an ideal fixture for large-scale sign and awning lighting. All parts, from the warehouse shade to the sturdy mounting plate, are made of commercial-grade aluminum finished with a rust resistant powder coating. 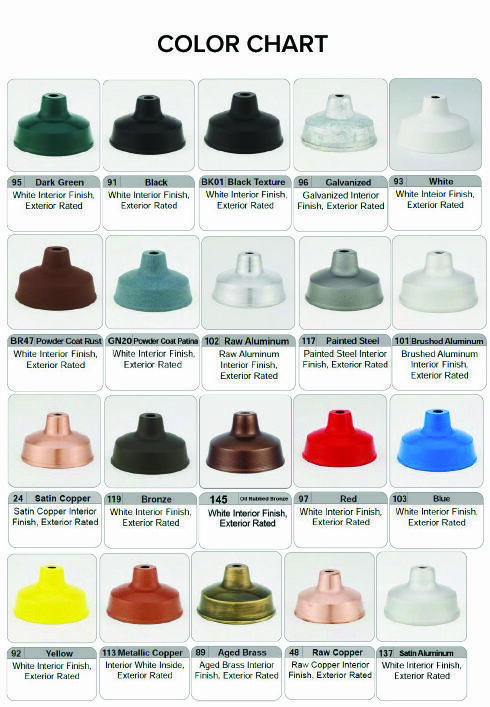 Pick from 25 attractive color options; 5 available at no additional charge. Gooseneck lights for wall mount have a round or box mount back plate with 3 1/2" on center holes. Install to any 4" recessed octagon box or 4" standard weatherproof box. Commercial goosenecks are built for outdoor applications but are also polished enough for interior use. Standard lamping for gooseneck lighting is standard incandescent. Upgrades to high-intensity discharge (HID), compact fluorescent (CF), or LED gooseneck lighting is also available. Please call for details and price quotes.